Start with two cups of Michigan tart cherries and a cup of sugar. Add a pinch of politics and a dollop of old-fashioned, big-government controls. Stir with some legal briefs. Bake until confused. That cherry pie calling your name at the National Cherry Festival this week in Traverse City is made in Michigan, but they’re a product of regulations that, in some years, has led Michigan farmers to dump cherries on the ground while products made with tart cherries are being imported from Canada and Poland. Grow? No problem. Sell? Ask Washington. The fact that the National Cherry Festival is held in Traverse City is no accident. About 75 percent of the nation’s tart cherries are grown in Michigan, and about 80 percent of Michigan’s cherries are grown in orchards in the Northwest Lower Peninsula. By comparison, Michigan’s auto industry accounts for about a third of the nation’s auto employment. In 2009, 30 million pounds of tart cherries were left on the ground, mostly in Michigan. That’s enough to serve a cherry pie to every resident of Michigan, with 5 million pies left over to take home in doggie bags. Unlike Ford and General Motors, though, the tart cherry industry is told by the U.S. government how much of their product they can put on the market. The Cherry Industry Administrative Board (CIAB), operating under the auspices of the Department of Agriculture (USDA), sets restrictions on the percentage of the tart cherry crop that can be sold. Some years the share of the market restricted from market is low, like this year, which has a 10 percent restriction. In 2009, it was a whopping 65 percent. Michigan tart cherry growers are shackled by those restrictions more than most. There are no restrictions on sweet cherries – the kind you buy in the fresh fruit section of Meijer. The restrictions don’t even apply to all tart cherries - there are no restrictions on tart cherries grown in Oregon or Pennsylvania, or on imported cherries. There are few such restrictions on other fruits and vegetables, Sherman said. But the harvest of other edibles doesn’t fluctuate as wildly as tart cherries. With so much of the nation’s supply grown in a tiny corner of one state, virtually the entire tart cherry crop can be devastated by one bad storm. At the other extreme, a good crop could flood the market and lower cherry prices to the point that it drives farmers out of business. Whether that restriction system works is a point of debate in the tart cherry world, and now in the courts. The restrictions don’t apply directly to cherry growers, but to cherry processors – the companies that buy tart cherries and can them (primarily for pie filling) or freeze them for processing into other foods, such as cherry juice. That brings us to the lawsuit, now being heard by an administrative judge within the USDA. The details are complicated even for cherry growers, so let’s leave it at this: there’s a fight over how many tart cherries can be sold by different cherry processors nationally. Companies that freeze tart cherries don’t have a problem with the restrictions, because they can fall back on cherries they’ve kept in storage, according to the lawsuit. Cherries freeze really well – they can be kept for at least four years. “As long as your freezer’s working, it’s almost indefinite,” said John E. Pelizzari, chief operating officer at Burnette Foods. Canned cherries, though, like the pie filling canned by Burnette Foods, have a shelf life of about a year. So in a year with high restrictions, the northern Michigan company may have to import cherries for its pie filling, while cherries are rotting on the ground in orchards a few miles away. In 2009, 30 million pounds of tart cherries were left on the ground nationwide, with the vast majority of those in Michigan. That’s enough to serve a cherry pie to every resident of Michigan, with 5 million pies left over to take home in doggie bags. In the lawsuit, Burnette Foods asks that the USDA tart cherry restrictions be removed because the restrictions don’t impact every processor equally, and don’t take into account sales of imported cherry products. Burnette also claims the cherry board, made up of cherry growers and processors from around the country, is dominated by people with ties to the frozen cherry processors. 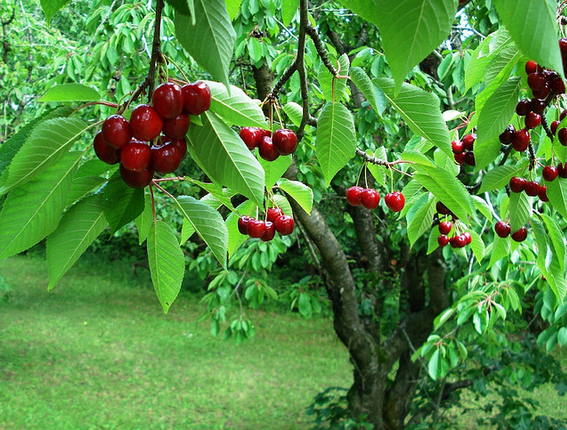 The cherries have to be harvested from the trees whether they are sold or not, so in a high-restriction harvest, farmers “shake” trees and leave a lot of fruit on the ground. Farmers don’t have the option of giving away large quantities of the fruit, either, because tart cherries are only used in products, and not eaten raw. That doesn’t happen every year. With a 10 percent restriction this year, processors likely will take all the cherries that are produced and hope to use or store them. David White, a cherry grower in Elk Rapids, said he’s had to leave cherries on the ground four times since 1990. More than leaving some cherries on the ground, White’s main complaint with the restrictions is that they’ve done little to increase prices for growers. But cherry grower Jim Nugent of Suttons Bay said he thinks prices would be worse without the USDA crop restrictions. “The main way they help the growers, they don’t put so much product on a market that it depresses prices,” said Nugent, one of several Michigan cherry growers currently serving on the cherry board. But a study conducted for Burnette Foods found the opposite – that cherry prices are mostly influenced by factors outside the control of the USDA, like the weather. Tart cherry growers and processors across the country had a chance to get rid of the market restrictions this spring, but about three-quarters voted to keep them. Nobody likes to leave crops in the field, but “we have an inelastic demand,” Nugent explained, marking perhaps the first time a story about cherry pie has included the phrase inelastic demand. If tart cherry economics wasn’t confusing enough, in March, an administrative law judge in Washington, D.C., hearing Burnett’s lawsuit ruled that the restriction should be lifted – but only for companies that can cherries, not for those that freeze cherries. That ruling is on hold pending an appeal. Politics, money, lawyers. A combination that makes cherry pie as American as, well, that other pie. I was up in Traverse several years ago touring the wineries. I questioned why there were so many fruit flies all over the place and this 'dumping cherries' business was explained to me. Have you seen the price of dried cherries? Absolutely ridiculous. If you were wondering why dried cherries cost so much it's because of the recent winters we've been having. Not only has it made the quality of the cherries worse but the ability to harvest is quite difficult as well. Some trees have died due to the amount of strain on branches to a point where the trees fall down or too many limbs are missing. The process and quality of cherries all depends on the weather and the amount of money we put in to keep bugs and other things away for them so you can enjoy our amazing fruit. I hope this sheds some light on your concern of our prices and I hope that we can have another great year like we did this year and make you and many others smile from ear to ear as you bite down onto our locally grown fruit. Interesting article. May I point out that the copyright on my photo restricts use to non-commercial use. Is this magazine a non- profit enterprise? Hi Julie - Your photo was posted on our flickr Michigan Photos group (http://www.flickr.com/groups/michiganphotos/). The "rules" section of the group stipulates that we can use the photos on our sites. We are a non-profit organization. However, if you'd like me to take it down, I'm happy to comply. Just shoot me an email: ajones@thecenterformichigan.net. Thanks! Aww, Julie, it's too pretty not to leave up for all to enjoy. last year was the first "time' I had tasted MICHIGAN cherries . I been in michigan for 50 years and alsways wanted/ask in groceries store. farmermarket WHERE ARE THE MICHIGAN CHERRIES? All i evry found was cherries from washtingon state. We need to save energy and gasoline .and cost.When food travels more then "I">! also what "organic" spray is on the friuts.? WE need to keep Michgan agri fresh and clean green and gorwing! Shop at the farmers market and bring back "FREE ENTERPRISE" for growers and consumers WE need to know "WHAT we eat and WHERE 'IT" comes from! NO nursing Homes for me! FREE GMO and DNA test on my food. Melvin, as the article states, northwest Michigan is responsible for a large majority of TART cherries not sweet cherries. So unless your keen on eating tart cherries I highly doubt your going to see a change in the import of SWEET cherries from Washington. The best part missed in the story is that under the new Farm Bill, these cherry farmers can buy subsidized insurace again crop loss disasters and fair pricing. They are then told to dump cherries to control market prices. They have a wonderful win win situation. It may make sense to plant the trees and never to harvest and just work the residuals of price control vs fair market price. Also buy the crop insurance and hope for a disaster. You should take it down anyway. As best I can judge, those are sweet cherries, not tart cherries. Typically, such governmental interventions are the result of rent seeking, or lobbying by economic organizations to secure profits that they would not otherwise earn in an unregulated market. If the government stepped away, the smaller, less efficient, and less profitable tart cherry growers would likely struggle and no doubt some would go out of business. Not sure about the validity of the claim of inelastic demand. I'd think if the prices of cherries fell, and also cherry pie, people would eat a lot more of them. It's my favorite kind of pie. Northwestern Michigan tends heavily to the Republican side of both local and State politics. Most of the cherry farmers and locals I'm acquainted with are dyed in the wool Republicans. They support a free market approach to the economy, low taxes, and the elimination of burdensome government regulation - unless of course you're talking about government assisted price fixing for cherries, disaster relief for failed crops and numerous tax write-offs to support the farming operation. As the former republican Defense Secretary William Cohen said, "the Government is your enemy until you need a friend." Farmers need to get a hold of Senator Debbie Stabenow. She is the one putting a strangle hold around farmers necks. Michigan farmers and fruit producers should hold Debbie Stabenow responsible the dumping of cherries. Really Dave? How about elaborating on that just a little bit? Strong allegation with zero back up. Dumping good, wholesome fruit because of an minimally- effective and prejudicial marketing order is insane. The environmental cost of this practice is equally insane. Even knowing well in advance of the need to dump cherries to meet the marketing order, orchardists must still fertilize, irrigate, prune, control weeds with herbicides and mowing, and protect the trees and fruit from fungus, insects, and other diseases using a spectrum of pesticides. Add to all of that the emissions from their gas and diesel powered farm equipment, and the environment cost is huge. All of this for what? And what are RINOs like Marco Rubio doing? Nothing!